Vry unique. At least I've never seen such a thing. Rather than buying and stocking two different kinds of BOB, you get two for the price of one. For one of them, I put the 3.3v VSSOP chip on one side and terminating on strips. Then I built a 3.3v regulator on the other side. Where ever there were pin conflicts, I just cut the traces and made connections thru tiny holes with wirewrap wire. These boards are so much cheaper than anything I found anywhere else, and they worked great for us! 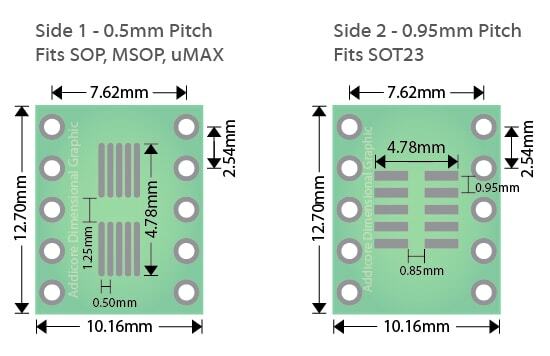 One thing I would like to see improved is placing a dot next to the pad for pin 1 so that the customer does not need to follow the trace and remember which way to orient the chip.